In this paper, we have performed virtual screening of compounds to identify potential inhibitors against the Penicillin Binding Protein 2B (PBP2B) of the resistant 5204 strain of Streptococcus pneumoniae. We have considered 1,677,620 compounds from ZINC database for virtual screening workflow of Schrödinger suite software to identify potential inhibitors that are capable of binding to mutated resistant 5204-PBP2B. Initially, we have obtained 1,247 hits and were prioritized based on protein-ligand contacts which resulted in 99 compounds. These 99 compounds were further clustered to obtain 25 structurally diverse compounds of which the top scoring compound 5-[(6- hydroxy-1,2,3,4-tetrahydroisoquinolin-1-yl)methyl]benzene-1,2,3-triol) with ID: ZINC59376795 may be identified as the potential inhibitor. 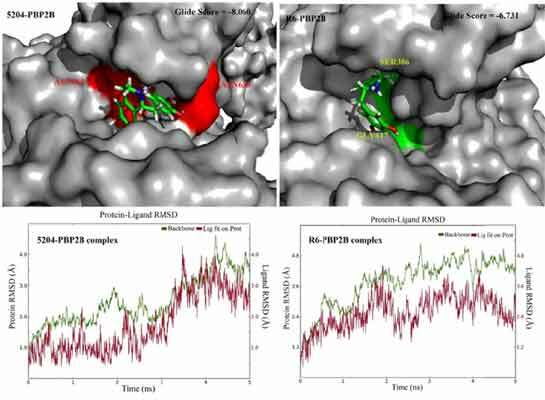 Molecular dynamics simulations were performed for the wild-sensitive R6-PBP2B and mutatedresistant 5204-PBP2B complexes with this top scoring compound ZINC59376795 and the binding patterns, RMSD calculations, protein-ligand contacts analysis provides deeper insights into the interaction patterns of this novel inhibitor against the sensitive-R6-PBP2B and resistant 5204-PBP2B of S. pneumoniae. Structure based virtual screening, glide docking, molecular dynamics simulation, penicillin binding protein, Streptococcus pneumoniae. Department of Bioinformatics, School of Life Sciences, Bharathidasan University, Tiruchirappalli 620024, Tamil Nadu, India.